The Other Line Always Moves Faster! “Vail Lift Lines Visible from Space” was a tongue-in-cheek fake headline put out by Black Diamond Designs that recently spread around the Internet. 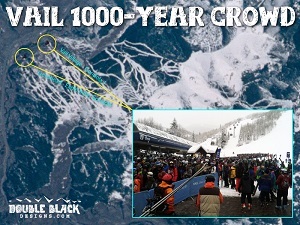 There was a doctored satellite photo that showed a very long line of people waiting for a Vail lift. Lift lines have always been the bane of skiers, particularly weekend skiers. Over the recent President’s weekend we saw some pretty good lift lines right here in Stowe. But today’s lift lines aren’t like the lift lines in the old RetroSki days. First, today’s lifts are significantly faster with higher capacity. We’ve evolved from single and double chairs to quads and six-packs, from two and four passenger gondolas to those that hold eight or more. These lifts can eat a long lift line with astonishing speed. Second, lift lines are more organized than in the past. There are separate lines for singles and lift staff help match up skiers to fill chairs. Mazes are divided into lanes that merge with “Please alternate” signs. Today even when the quad line overflows the maze or the gondola line backs up to the dragger lift, the wait is only about twenty minutes. In the old days, lift lines on busy days could be forty minutes or longer. 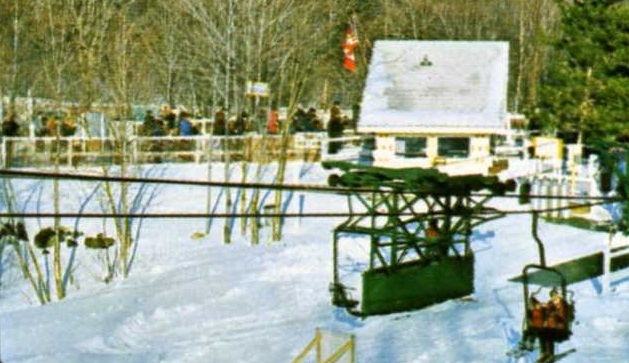 In fact long lift lines played an important role in Stowe’s history. The story goes that C.V. Starr got tired of the long lift lines on the old single chair so he built the original Mansfield T-bar. There was minimal organization to the old lift lines which led to the sport-within-a-sport of improving your position in line. The typical organization was a maze that wrapped back and forth on itself and every turn in the line was an opportunity. Trying to make a tight 180 degree turn with 215 centimeter skis was not easy so a good corner technique could buy you a place or two in line. In Stowe the old single and double chairs shared a common line that was about 15-20 feet wide. There was no maze and until you went by the ticket windows there was no differentiation between those headed for the single chair and those headed for the double. With such a wide line there were ample opportunities to improve your position. I had a friend, who will remain nameless, who could improve his position by 5-10 chairs every time through the line. I’m sure he didn’t make many new friends in the process. Oh yeah, I should mention those ticket windows. I’m sure when someone designed the line it sounded like a good idea to be able to get in one line to buy your ticket and get on a lift. However mixing people buying tickets with those who already had tickets was not a good idea. If you were on your third run, the last thing you wanted was to wait for some stranger to buy a ticket. As I recall, the ticket windows divided the one line into three lanes – a left lane and two center lanes. Despite the fact the left lane was narrower, it was the faster lane so staying left worked better. Once through the ticket windows, the double line went left and the single line went right. So if you took the faster left lane, but really wanted to ride the single chair, you had to fight through two lanes of not-always-cooperative skiers. What does all this have to do with last week’s trivia question? Etorre’s Observation is really an application of Murphy’s Law to waiting lines. In its simplest form it says “The other line always moves faster!” I’m not surprised that there weren’t any correct responses, but the next time you’re figuring which lane to enter in the FourRunner quad maze remember, no matter which one you choose, the other one will be faster!